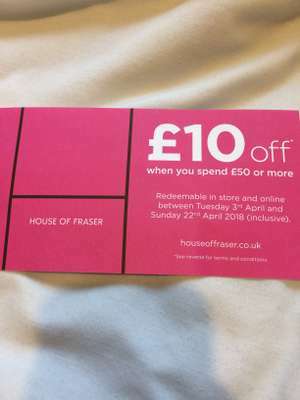 I was given a £10 off a £50 spend at House of Fraser Reading. Not sure if it’s every store on every purchase. Awesome. Looks like their Rollback campaign from the AW17 for SS17. Will have to get a few of these gems when I’m next in HOF City branch ! They are in every store. You are only given them when you make a purchase and they are kept hidden behind the tills so you can't just pick one up. They are valid from April 3rd on full price items only with some brands excluded. Anyone knows if coupon can be used with beauty items ?